Who Are The Azusa StreetRiders? Answer to an Email. This was published almost four years ago but stands the test of time… Please feel free to comment! 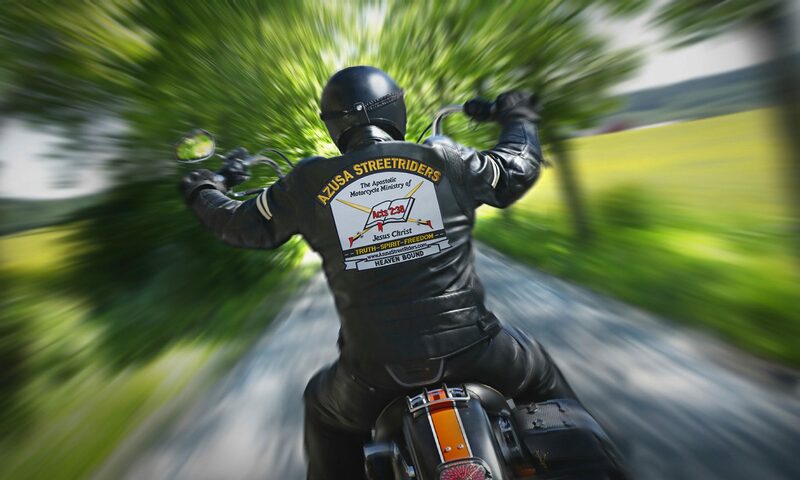 Many people have heard the name “Azusa StreetRiders” and know that it’s a motorcycle ministry, some even know we’re an Apostolic motorcycle ministry. But who are the Azusa StreetRiders? Pastor, what do you know about us? Apostolic motorcycle rider, what do you know about us? In response to an email received on July 22, 2015, I attempted to answer the question received with the subject title “Just Want To Know.” I have modified the email below to only correct punctuation, spelling and grammar and to hide the identity of the individual who sent it. My response is nearly verbatim as to what I sent to him. As of this writing [and as of January 2019], I have not heard back. Sent from my iPad. I would like to know if your colors are copyrighted? You see I’m a believer. There’s only one God, one Faith and one Baptism. And I do believe in Acts 2:38. And I have been baptized received the Holy Ghost and I do speak in other tongues. But our church is having some problems and my pastor, well, I should just say pray for him. I told him I would like to ride with your colors but never heard anything and that was two years ago. The reason I ask about your colors is that our church started in Southern California in the early 1930s following the Azusa Street Revival. And, well you know the rest. God just moved in a mighty way and now we preach all over the world and God is moving in a mighty way. See most of you that are saved, you got in your comfort zone and don’t have that drive anymore. You forgot where God brought some of you from. Sorry but that’s the way it is. If you boys need someone in California, fast, pray and leave it to God. He’s always been there. Regardless, I’m going to my Master. Greetings in Jesus’ Name! With interest, I read your message and inquiry above. Thank you for taking time to ask questions and share your thoughts. Our colors are not copyrighted although several people have suggested that we do so. With the cost of design, set up, and embroidery, it is unlikely that someone would go to the trouble and expense of duplicating our backpatch. Should that happen, we would address it at that time and legal precedent is on our side to protect our colors. But seriously, this is of no concern. From what you say, and assuming you are a faithful member of your church, you are definitely a candidate for membership in Azusa StreetRiders. All that would be required is the application completion and approval of your pastor. But, as you say, your pastor never responded to your inquiry about joining us. Please don’t be offended, but could it be, that you are not a “faithful” member of the church? Being a “faithful” member of your church is one of our requirements. Over the years, we have had many, what I call, “rogue” Apostolic bikers try to join us. Some were successful, but most were not because of the insistence on a pastor’s approval to join ASR. By “rogue,” I’m simply referring to someone who has issues with authority and submission, both of which are solid Biblical principles. If someone cannot be “faithful” to a pastor and his church, can they truly be “faithful” to the kingdom of God? As for your pastor, I pray every day for pastors around the world who preach God’s saving Acts 2:38 message. Hopefully he is in “right standing” with the Lord! I believe that many believing Christians, even many Apostolic pastors, will be surprised on Judgment Day just as they were in Matthew 7:21-23. Not knowing your pastor, I/we will pray for him and other pastors, that God would give them clear direction in these end times! As believing and faithful Apostolics, we must wisely balance our efforts to reach the lost. We believe this is done with the approval of and under the watchful eye of our pastors. If we have truly submitted to him, he should know us well enough to know whether or not we are capable of stepping into the world to “bring them out” or if we would be drawn back into the world. Highways and hedges ministry, true outreach into the anti-Christian cultures of the world, is not for everyone! I would like to think that every member of Azusa StreetRiders is capable of doing so, but, realistically, I know this is not true. Hanging out in the bars and at the 1%ers’ parties, to us, runs contrary to the two scriptures cited above. Saying that, we try very hard to interact with 1%ers and others who are lost at any opportunity made available to us. We are a ministry, not a club! We try to avoid the club mentality. Yet, we do things that would surprise many Apostolics. For example, in my hometown of Myrtle Beach, SC, we have cosponsored a couple of events with the Hells Angels. This opened the door for me to teach a Bible study to the local chapter president and for several years, we were able to take his two boys to our church for Sunday school. Although not in church, he is a good friend today. My suggestion—again, it’s up to the individual’s pastor—is to attend every function sponsored by any of the bike clubs or ministries. In doing so, however, I also suggest that we do not “enter” the bars, but rather stand outside and witness! This is especially effective for us during poker runs. By using this approach, I have been told by 1%ers on several occasions and have had other club members tell me that there is a different, higher level of respect given to Azusa StreetRiders because we are not perceived as a “sitting-on-the-fence-ministry.” Other ASR members have had similar statements made to them for approaching outreach in this manner. The term “comfort zone” to you seems to mean “going places where church-going Christians do not typically go.” Food for thought… Could it be that your “comfort zone” is in the bars and with the 1%ers and hanging out at church is OUTSIDE of your “comfort zone?” Don’t be misled into thinking that you can only reach those you are trying to reach by being just like them! Read Romans 12:2. If after reading this you have more questions about Azusa StreetRiders, please let me know and I will try to respond or have a conversation with you at any available time. If you desire to join us based on our outreach model cited above, I suggest you fast and pray about it and if God directs you, download our application, fill it out completely, take it to your pastor and have a serious conversation with him about your walk with God. Then have him sign it, and mail it to us. We will welcome you with open arms and put you to work with Azusa StreetRiders for His Kingdom! May God bless you, my friend! We are all on the same team. I look forward to hearing from you soon. Fred Beall and his wife Diane Beall are the co-founders of Azusa StreetRiders, "The Apostolic Motorcycle Ministry of Jesus Christ." He served for 16 years as the first President of ASR and stepped down in 2015. He and Sister Beall reside in Myrtle Beach, SC and are active members today attending as many ASR events as possible.